General Data Protection Regulation (GDPR) is coming into effect on May 25, 2018. The requirements of GDPR are substantial and the penalties for non-compliance are severe. The new regulation will require companies across the globe to rethink how they store and handle customer data. Has your organization implemented the legal and technological controls required to comply? 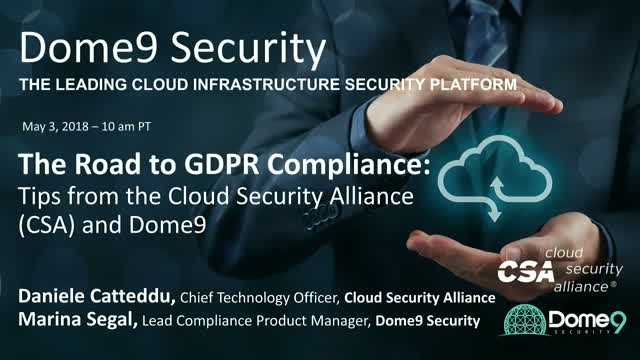 In this webinar, Daniele Catteddu, CTO of the Cloud Security Alliance (CSA) and Marina Segal, Lead Compliance Product Manager at Dome9, will discuss key challenges and best practices to address GDPR requirements. The webinar will cover compliance automation solutions available to help organizations achieve GDPR compliance and meet the May deadline.